"Opening Day of hunting season has everybody's mouth watering for this simple recipe. 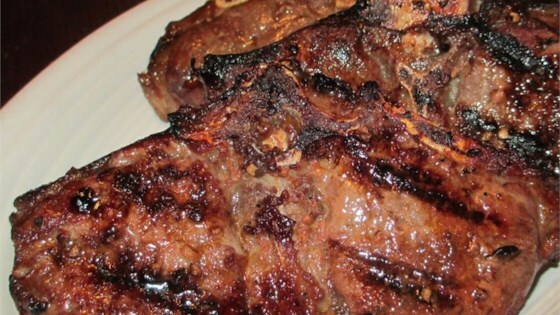 The marinade helps pull out some of the game taste in your meat hence the name 'No Fun.' This recipe is a great way to wow that special somebody who doesn't like the taste of venison." Stir together the soy sauce, hot sauce, orange juice, garlic, and orange zest. Marinate the venison steaks 2 hours to overnight. Remove steaks, and discard marinade. Grill to desired doneness, about 7 minutes total for medium, depending on thickness. Grilled marinated lamb dressed with a minted honey and sherry vinaigrette. Excellent marinade!!! it´s fast, easy and delicious. The orange juice/orange zest combo is too much for me. Recipe was perfect-not salty at all. I marinated for approx. 10 hrs and turned the venison every couple of hours. A 1" steak took approx. 15 min. turning once for a medium-well.